but currently the number of Tor Relays or Exit Nodes visible to the rest of the world is zero - see the BlutMagie Tor Router Status page. Obviously the thousands of Tor Client software users in China are also being blocked.. Does this signal a new crackdown on political and religious dissidents in China ? Is there some new corruption or incompetence scandal amongst the Communist party hierarchy, news of which they are trying to suppress ? Feel free to let us know about any Tor Bridges you set up to help route around the Chinese censorship (ideally via PGP encrypted email), but obviously do not publish their details in public via the blog comments below. We will then pass them on to some contacts in China. The Twitterverse and the mainstream media seem to be convinced that Twitter and Facebook etc. are important in getting first hand reports and images and videoclips, past the Iranian government censors. What then, can the more than merely internet literate readers of Spy Blog do, to help ? If you are not doing so already, then you could help Iranian democracy, and similarly repressed people in Burma, China, Tibet, Zimbabwe, Pakistan, Cuba etc. by running a Tor Relay or even a Tor Exit node. You would be giving something back to the community, which you yourselves will increasingly have to make use of,in order to escape from the Labour Government's "Eye of Sauron" Intercept Modernisation Programme / Communications Data Bill plans for retaining and snooping on your Communications Traffic Data etc. . 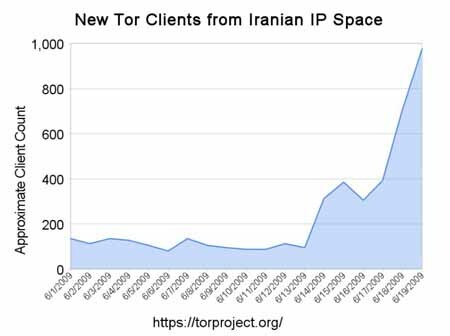 There is evidence that Tor is being used in Iran, even though various internet ports may have been temporarily blocked by the Iranian regime. Spy Blog, whilst not yet hosting a full mirror, is hosting a copy of the Tor download mirror sites information page. If you are desperate, here is a copy of the Tor / Vidalia / Tor Button / Privoxy bundle for Windows (approximately 8Mb) - currently version 0.2.0.34. Remember to read and understand the warnings about the ways in which you can still betray your real IP address, even if you are using Tor. See - Dispatches from the Iranian cyberfront. 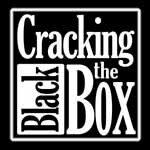 Austin Heap's blog is helping with sorting out configuration files on different platforms and collecting and testing) the IP addresses of open Squid proxy servers and communicating these to the Iranian protestors without tipping off the Iranian regime's censors. Continue reading Tor relays and exit nodes for Iran, and for the rest of us. I became interested in Tor in the spring of 2007 after reading about the situation in Burma and felt that I would like to do something, anything, to help. As a geek and lover of the internet it seemed the best thing I could do was to run Tor as an exit node to allow those under jurisdictions that censor the internet free access to the information they need. I had a lot of unused bandwidth and it seemed like a philanthropic use of it to donate that to Tor. I totally believe in Tor. I think it is a magnificent force for the circumvention of internet censorship but there is a problem. I was visited by the police in November 2008 because my ip address had turned up in the server logs of a site offering, or perhaps trading in (I was not told the details of the offence) indecent images of children. The date of the offence was about one month after I started the server so it looks as though the site in question had been under surveillance for more than a year. It was what is known as a 'dawn raid' and, amazingly enough, my children were still asleep when it occured. Thank God. I explained to the officers, who we had heard threatening to break the door down before we let them in, about Tor but they had never heard of it. My wife says she thinks they were about to arrest me before that. I was not arrested. I was told not to touch the computer and it was placed, considerately, in a black plastic bag and taken away for forensic examination. I was OK at first. I knew that somebody had gone through my server to access that material and that I was not guilty of any offence but as the weeks wore on it started to get to me. I was overwhelmed by horror to be implicated in such a thing. I was desperately worried about my family. One of the officers had told my wife that Social Services would be informed as a matter of course and there was a possibility that my children would be taken into care. The low point came about two weeks after the visit by the police when I totalled my car. I was distracted, stressed and unable to accurately assess the road conditions. I ploughed into a hedgerow at speed, destroying the car which we had just bought, but, luckily, walked out of it with only bruised ribs. I didn't have the money to hire a lawyer so I just sat the thing out. From time to time the police called with an estimate of when the investigation would be finished but none of that meant very much because those dates came and passed with no resolution. Eventually, four months after the visit, I picked up a voice message from the police inviting me to call back. When I called I was told that no evidence had been retrieved and the machine would be returned to me. I think, in retrospect, I was desperately naive to run a Tor exit server on a home computer but I didn't believe that an ip address in a server log would be enough evidence to warrant seizing equipment. My wife, God bless her, was absolutely marvellous throughout the whole thing and never doubted me. I have read with interest about the need to make Tor faster and that that largely depends on having more nodes but there is no way I can contemplate offering my ip address as a service to internet anonymity any more. It was very frightening for me to be implicated in a serious crime. As a parent of very young children I have an extensive network of friends and contacts in my neighbourhood who also have children. As we know the subject of paedophilia is not one that can be debated with any rationality at all in the UK. It is surrounded by hysteria. I was terrified that people would find out that my computer had been taken because of that - 'no smoke without fire'. I don't know what can be done about any of this. To my mind running an exit node is extremely high risk. I think Tor is important but I don't have any ideas about how to support it at the moment. Why are there are still any untrained Policemen in the UK, who are being allowed to conduct internet crime related investigations, without having first learned about open proxy servers, Tor and other techniques ? They need to be disciplined and retrained, and their senior managers need to be named and shamed, as they are an unacceptable risk to innocent members of the public, and the real criminals must be running rings around them. Surely if major UK ISP's are now only offering a censored CleanFeed system, then there is no excuse for the Police to harass their customers in this way ?